Nearly there as we record the 98th and 99th members of the 30+ club! The headline says it all! We are now so close to the magic 100th member of the Cherry Lakes club as this week has seen two new to Cherry Lake guests catch a 30+ Carp. The 98th member is Ian Blackwell who has been staying in the Cottage this week with his family. Fishing primarily at either end of the day around family days out, Ian was delighted when he landed the ‘Pretty One’ at 35-04. 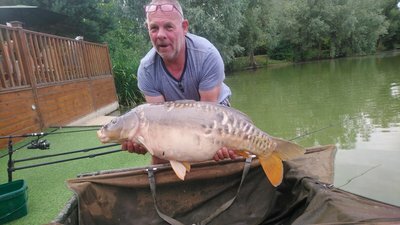 Regular readers will know that this Carp came out last week to Gary Owen at a very similar weight. This time I got to see her….and she looked in great condition and every ounce of 35lbs as you can see from the picture below. The successful bait was the Cherry Lakes fish supreme boilie fished ‘snowman’ style. The 99th member is Damien Baker. Damien has been fishing from Grebe Lodge and has landed four Carp so far including Mirrors of 26-08, 24-04 and 21lb as well as ‘The Scuff Common’ at 32-04 also pictured below. Well done to both Damien and Ian who were both very pleased with their respective 30+ polo shirt and 35+ hoody..
We now have the Champagne on ice and look forward to celebrating the 100th member of the club (well at least one glass of the bubbly-stuff!). We have also had some good fish being caught from the other lakes across the complex this week. Andy Marshall sent through the photo of this impressive 28lb Mirror from Pochard Lodge on Cherry Mere. Judging by the ‘frame’ of this fish, if sh keeps eating the boilies, she should make 30lb+ in the not too distant future. Neil Flack who has been staying in Kingfisher Lodge landed this stunning 22lb Mirror below just as I was passing, after photographing Damien’s big one. As both Neil’s and Andy’s are both well worth seeing, I have indulged myself with four photos today. I hope you enjoy them all. 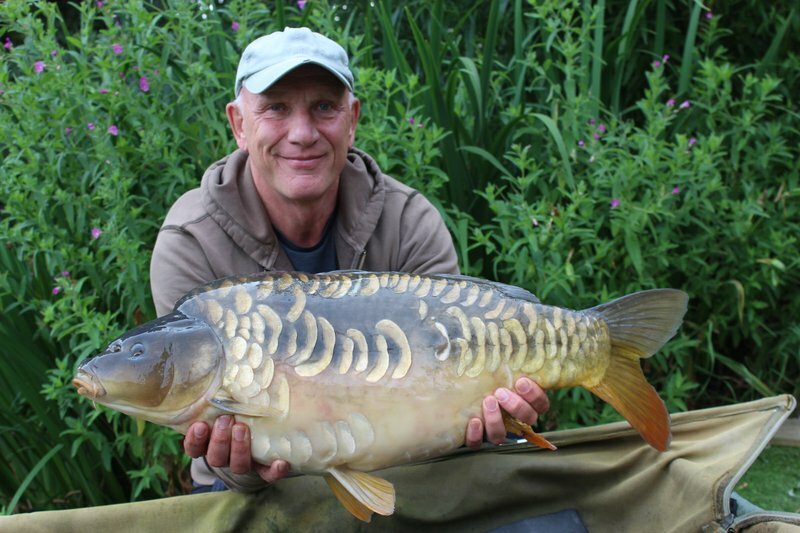 Ian Blackwell was delighted to catch the stunning ‘Pretty One’ from the Cottage swim. Andy Marshall with a 28lb Cherry Mere Mirror. The biggest of his trip to date.